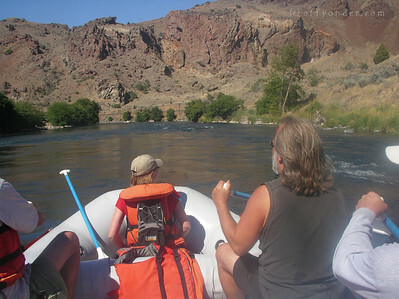 Most river trips are not limited to just being on the river. Sure, on some trips there is plenty of time to make the transition from being on the river to exploring the land along the river. But sometimes you want to hit the ground running right as you’re pulling your boat onto the shore. For both of these scenarios OR’s DryComp Ridge Sack fits the bill. I have a nice little Mammut backpack that I love and use for the majority of my terrestrial trips. For it to come on my river trips it needs to be stored in a dry bag taking up valuable waterproof room. 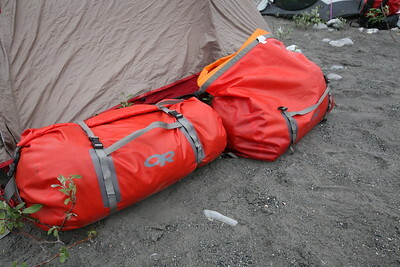 Enter the DryComp Ridge Sack. 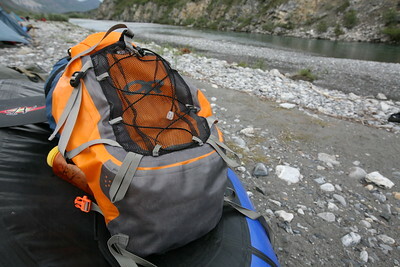 Lateral access to my gear was a phenomenal convenience on my recent 15-day river trip in the Arctic. The biggest concern anyone has regarding the functionality of a dry bag is “does it keep my gear dry?”. In short, yes. Granted, I never tipped my boat to have it mauled by massive rapids as a potential test. But everything I put in those bags for days on the river stayed totally dry – guarding against full over-the-bow waves and a few squalls of rain. My Uncle Eddie has been rafting for many, many years. I remember when I was young, doing 15 miles down the Santiam River (san-tee-AM), a tributary of the Willamette River in Western Oregon with him and a bunch of our family. Well, since then, I’ve started joining him on more trips and have been helping him guide trips.